Skip Battin is best remembered as the bass player in The Byrds, who he joined in 1969, proving a strong addition to the group’s line-up during their later era. With Skip in the band, extensive touring over the years made The Byrds one of the best live acts of the period. By 1972, every member of The Byrds was poised to release solo albums. It was Skip Battin (along with his writing partner Kim Fowley) whose prolific output ensured that he was first off the mark. 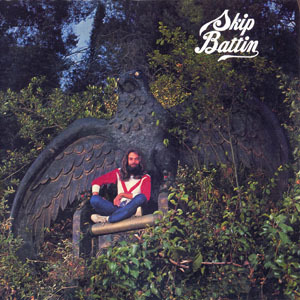 Employing the talents of various Byrds and selected associates, Battin’s debut solo album Skip, reissued here on remastered CD, boasted a formidable list of participants including Roger McGuinn and Clarence White. All the songs were composed by Battin &Fowley and sound like extensions of the material the two had been producing for the Byrds. This CD booklet features extensive liner notes by Johnny Rogan.